Don Juan features screen idol John Barrymore in the title rôle, playing a character quite a bit different from the standard swashbuckling hero. He’s pretty much a bad apple, a vain, selfish, dishonest conniver obsessed with the seduction of women, who if he does the right thing, it’s usually for the wrong reason. In short, he’s nothing like the sanitized Don Juan of the later Errol Flynn movie, and for most of the picture we wonder how he and his lady love are ever going to get together and win free of his appalling situation and conduct. 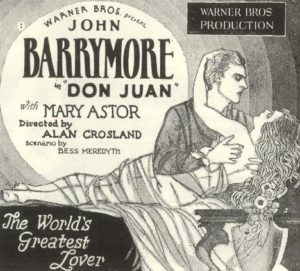 In this the story draws heavily on the forty-something Barrymore’s own reputation as “the world’s greatest lover,” a rake and roué with a string of abandoned starlets behind him. In a bit of inspired casting, one of his real-world discarded lovers, the barely-legal Mary Astor, was given the part of Don Juan’s one true love, Adriana Della Varnese, and their scenes together are smoking. In fact, generally speaking the acting in this film is unusually good, especially from the villains, who are delicious—but more about them below. After a short gothic-horror first act that establishes the reasons for Don Juan’s eternal distrust and disloyalty to women—adultery, murder, and bad parenting, the usual excuses—the story moves to Rome circa 1499 during the bloody reign of the Borgia family. To further establish Don Juan’s character, we then get a twenty-minute bedroom farce in his Roman town-house during which the great lover simultaneously juggles the affections, and locations, of three different young ladies. Eventually the women’s husband/uncle/lover intrudes in high dudgeon, hilarity ensues, and everyone runs off, leaving Juan to consult with his valet on his romantic schedule for the evening ahead. But Lucrezia Borgia (the sneering and lascivious Estelle Taylor) has cast her acquisitive eye on Don Juan, and he is summoned to a ball that evening at the palace of the Borgias. Lucrezia is determined to have Juan to herself, and she’s a lethally jealous lover, but all too soon he sees and is smitten by the innocent young Andrea Della Varnese—who is herself desired by Count Donati, a Borgia crony. In no time we are hip deep in burning gazes, derisive taunts, poisoned chalices, and any number of balcony climbs. Love and politics are intertwined, and when the Borgias finally break with the Varneses, blood runs in the streets of Rome, and Don Juan has to decide what’s really worth fighting for. The bells announcing the impending forced marriage of Andrea to Donati drive him nearly mad, and during his climactic confrontation with the Borgias he seems more dangerous than they do, genuinely unhinged, where the villains are merely wicked. There’s a very satisfying and acrobatic sword duel, but though that’s where most swashbucklers conclude, here it’s just the prelude to the lurid final act, where both Andrea and Juan are clapped in durance vile. By the time Juan escapes the dungeon, it may be too late to redeem himself. This film looks fantastic: “lush” and “opulent” don’t even begin to describe it. It also marks a technical advance in the march to the talkies, a process called “Vitaphone,” with a pre-recorded musical soundtrack synced up to the action, augmented by sound effects like bells, thumping blows, and clashing swords. The Borgias’ Roman orgies, with their dancing damsels clad only in swirling veils, and a bibulous Bacchus surrounded by vine-draped maenads, are very persuasive, plus this overstuffed film gives us leopard-skin-clad African sedan chair porters, an evil dwarf castellan, a sinister poison-making alchemist, and a jilted lover sealed up alive in a castle’s walls. Also, watch for the striking Myrna Loy in an early rôle as Lucrezia’s intriguing maidservant. And did I mention that Don Juan wears striped asymmetrical trunk hose? Don’t miss this one.